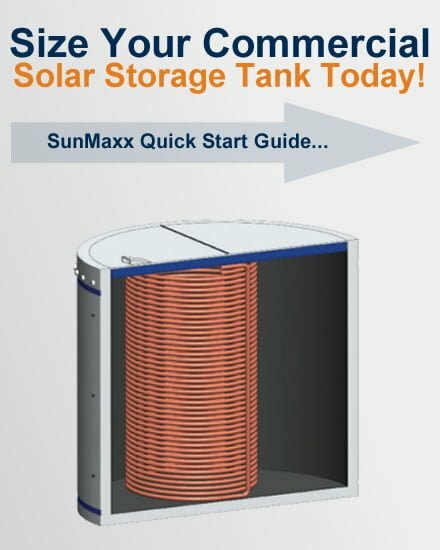 SunMaxx manufactures a variety of solar hot water storage tanks designed for commercial and government installations. Combining both European and U.S. technology, these tanks store large amounts of solar energy at lower temperatures, which will reduce costs and improve the quality and overall performance of the solar systems. Step 1: How Much Space Do You Have For A Storage Tank? Find a location where you would like to install your storage tank (basement, mechanical room, etc), determine how much space you have using the diameter and height of the solar storage tank. Step 2: What Is Your Current Hot Water Source? Step 3: Determine The Solar System Size! How? Call us today or visit our Pre-Packaged Kits Page (which include pre-configured solar storage tanks for most applications). Now Featuring 10-Year Standard & 20-Year Extended Warranty Options! Ask Your Rep For Details!